Soil surveyors mapped the potential for agriculture in Canada through the twentieth century. In honour of World Soil Day, this blog post reports on a collaborative research project that explores the history of soil science in Canada. Launched in June 2018, the project documents the history of Canadian soil scientists and their research programs, as well as their documentary and artefactual heritage. This project was generously funded by the Canadian Soil Information Service at Agriculture and Agri-Food Canada. From the permafrost cryosols in the north to the productive loams in the south, the soils of Canada have developed over millenia. It was only in the first decades of the twentieth century, however, that Canadian scientists began to better understand and map these soils (1). Soil Monoliths overlooking my workstation in the CanSIS offices. Soil science in Canada did not develop in isolation. Canadian scientists, many of whom were trained in the United States, collaborated with American counterparts to survey soils in the border region and learned new techniques. During one such survey in the 1920s, Manitoba Agricultural College professor J.H. Ellis (who earned his PhD at the University of Minnesota) crossed paths with Constantin Nikiforoff, a Russian soil scientist and refugee from the revolution who had emigrated to the United States in 1921 (2). J.H. Ellis's adaptation of the Nikiforoff soil-survey method, presented in 1932. Later, soil science was advanced when federal funding became available through the Prairie Farm Rehabilitation Administration (PFRA) in 1935. This federal initiative provided funding for scientists in provincial agriculture departments and agricultural colleges to conduct soil research(2). It also led to the National Soil Survey Committee, established in 1940. 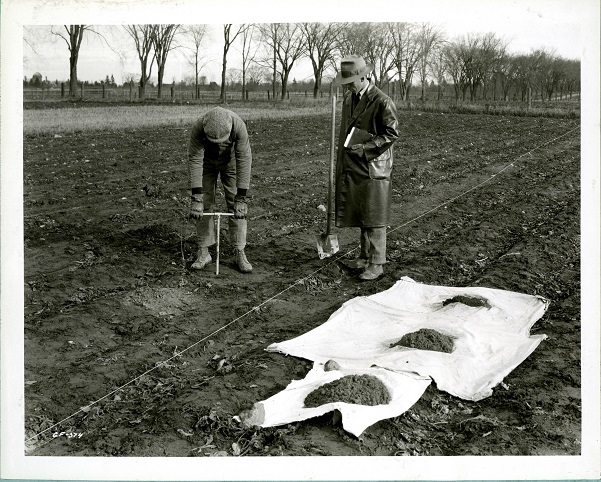 The Central Experimental Farm’s Peter C. Stobbe and A. Leahey spearheaded this committee and worked closely with scientists such as Ellis to create a standardized system of soil classification in Canada (5). Later projects, such as the Canada Land Inventory (CLI) begun in 1961, emerged from this collaboration. The CLI, drawing on soil surveys already conducted, centralized and mapped this knowledge, shaping expectations and decisions about optimizing land use. Initially focused on agricultural concerns, the CLI expanded to other land and water uses including forestry, recreation, hunting, and sports fishing (6). At the same time, more geographic data was being produced than could be expressed using manual-mapping techniques. Shannon Studen-Bower has recently shown how new computer and digital technologies enabled the CLI’s ambitions and led to the creation of the Canadian geographic information system — a precursor to modern GIS software — as well as a suite of hardware, standardized field note forms, and survey techniques (7). While the CLI and its land-capability classification scheme still influences decision makers today, the work of soil scientists has continued to change to meet new challenges. Writing as he approached retirement in 1995, federal scientist Alex McKeague argued that preserving soil — especially arable soils — requires a “healthy national soil survey organization” (8). McKeague had witnessed how priorities for soil science had shifted in agriculture science, but remained confident that soil scientists would continue to provide direction in the future (9). This historical narrative provides the backdrop for my work this summer. My task was to begin excavating the documentary and material culture of late twentieth-century soil science, while placing it in wider context. As a historical research consultant for Agriculture and Agri-Food Canada’s Canadian Soil Information Service (CanSIS), and in partnership with the Canada Agriculture and Food Museum and Nipissing University’s Centre for Understanding Semi-Peripheries, I had three main deliverables. Peter Stobbe's 1945 hand-coloured soil map of the Central Experimental Farm scanned this past summer. The Neatby Building is located at the top-centre of the map. First, I created an inventory of material stored at the Central Experimental Farm. The storage areas on the farm proved to be a trove of historical materials. I found and logged the papers of retired scientists, old maps (including a 1945 pencil crayon-coloured soil map of the Farm by Peter Stobbe), scientific instruments, assorted publications, soil monoliths, and thousands of slides dating as far back as the 1940s. I also began a series of oral history interviews with retired scientists, which will continue through the fall. The goal of these interviews is to explore the goals, assumptions, and evolution of soil science over the last 50 years. Both the interviews and their transcripts will be digitized and made available for future researchers. Now in process are a number of public history deliverables describing both the research process (such as this post) and my findings. Building on inventory and oral histories, my goal is to tell the rich story of Canadian soil science using narratives, historical geographic information systems, and other online tools. Documents and other materials scanned during this project, along with interview transcripts, will be made available online. This slide, found during the research project, shows Canadian and American soil scientists collaborating during the Ontario-Michigan correlation soil survey. Just as Canadian soil science has been a collaborative effort, so too is my excavation of its history. This project was undertaken in partnership with public historians (William Knight and Cristina Woods), historical geographers (Kirsten Greer and yours truly), and soil scientists (Dave Howlett and Xiaoyuan Geng). Each group brings their own expertise, interests, and funding opportunities to the project. Our common goals include developing a historical narrative of Canadian soil science for public and academic audiences. My hope is that the work undertaken this summer will serve as a proof of concept for interaction between experts in the arts, social sciences, and agricultural (including soil) sciences. Our goal is to continue the project beyond our current funding horizon and to dig deeper into the history of soil science in Canada by examining the interaction between federal and provincial scientists, the influence of international expertise, and the enlistment of expert knowledge in shifting political goals from agricultural settlement to environmental sustainability. (1) J.H. Ellis, “History and Development of the Soils Department in the Faculty of Agriculture at M.A.C. and the University of Manitoba, 1906-1955,” Unpublished report (Winnipeg: 1955). (2) P.C. Stobbe and J.A. McKeague, History of Soil Survey in Canada, 1914-1975 Historical Series No. 11 (Ottawa: Department of Agriculture: 1978): 6-15. (4) J.H. Ellis, “A Field Classification of Soils for use in the Soil Survey,” Scientific Agriculture 12.6 (1932): 338-345. (5) J.A. McKeague, “Soil survey and genesis and classification research in Canada,” Canadian Journal of Soil Science, 75 (1995): 3-9. (6) Shannon Studen-Bower, “Tools for Rational Development: The Canada Land Inventory and the Canada Geographic Information System in Mid-twentieth century Canada,” Scientia Canadensis 40.1 (2018): 44-75. (7) Studen-Bower, “Tools for Rational Development”; see also: “ARDA: The Canada Land Inventory: Objectives, Scope and Organization” Report No 1 (Ottawa: Department of Forestry, 1965). (8) J.A. McKeague, “Soil survey and genesis and classification research in Canada,” Canadian Journal of Soil Science, 75 (1995): 3-9. Peter Anderson is an environmental historian and historical geographer of science whose work explores the relationship between how we learn about the world and how we live in it. He recently completed a project on the early history of the Central Experimental Farm. His current project "Excavating Canadian soil science history" is undertaken collaboratively with historians, geographers, and soil scientists.